In the back of the Cathedral of the Immaculate Conception in Albany, New York, a bride has her veil moved into place as she prepares to walk down the aisle for her wedding. In the quiet moments which precede the big moments of a wedding day, I love to find those little, telling wedding images which capture the emotion and the feelings people are having. Often two photographers at a wedding aren’t necessary. As a well experienced wedding photojournalist, I know where to be so that great and unique wedding photos can be captured at your Albany wedding. Whether you are having a full Catholic wedding mass in a cathedral or something more simple such as a wedding by the side of a lake...In finding the best Albany wedding photographer for your wedding, consider whether your photographer will take mostly staged wedding photos or if they take a modern wedding photography approach in Albany by understanding through deep experience when, and where, the real moments happen at a wedding so they can be in place to capture them. That is a key to my approach as a documentary wedding photographer and wedding photojournalist. I know everything that is going to, and can, happen at a wedding since I have photographed hundreds and hundreds of them over my career. This allows me to be in the right place at the right time, anticipating those real moments whether they take place at a country club such as a Wolfert’s Roost wedding in Albany or if you are having a more casual capital district wedding...For me, the key to this Albany cathedral wedding photo is the moment the veil is lowered, meaning the bride is seconds away from walking down the aisle. 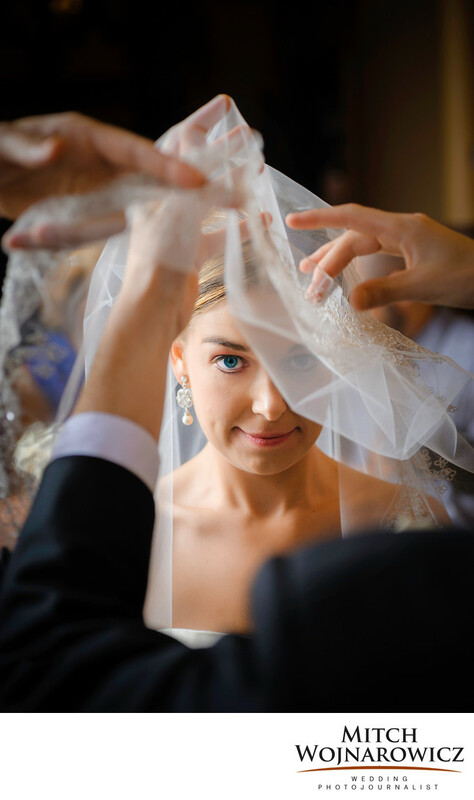 The anticipation of the wedding day, the nerves, really the future is all going through the bride’s mind before she takes that first step down the aisle with her father. Keywords: albany (45), cathedral (6).